Bail hearings were to be held Monday for four men charged in the vicious beating and stabbing murders of six people in a house in Deltona Beach, Fla.
"Another senseless killing, multiple killing. I mean, it's over clothes and an Xbox. And a vendetta," Sheriff Ben Johnson told CBS affiliate WKMG-TV. "They walked into this house with the intent of killing the people in the house. And you had six innocent victims in this residence." The bodies were found late last week in the blood-spattered winter home of one of the victims' grandparents, police said. Troy Victorino, 27, Robert Cannon, 18, Jerone Hunter, 18 and Michael Salas, 18, are charged with first-degree murder and armed burglary. The teens confessed shortly after they were arrested Saturday, authorities said. 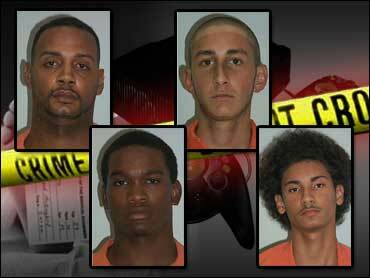 All four were jailed in Daytona Beach while awaiting bail hearings Monday. Police said the attack was the brutal culmination of an argument between Victorino, an ex-convict, and one of the victims, who is believed to be Erin Belanger, 22. She was singled out for a beating so vicious that even dental records were useless in trying to identify her. "I've never seen anything like it," said Johnson. "And out of all of my investigators and members of the crime scene — none of us have ever seen anything with this amount of brutality used — this much rage involved in it." Belanger's grandparents, from Maine, own a winter home in Deltona, between Orlando and Daytona Beach, which was supposed to be vacant this summer, but police said Victorino and other squatters used it in July as a party spot. Joe Abshire, Belanger's brother-in-law, said she had talked to him last Sunday about heading to the vacant house to go swimming one day and finding about six people living there. The squatters were kicked out, but the Xbox video game system and clothes were left behind. Belanger took the items back to the three-bedroom rental home she shared with friends. Over the next days, deputies were called to the grandparents' house six times. The victims also reported a tire-slashing at their home and a threat. The squatters warned Belanger that "they were going to come back there and beat her with a baseball bat when she was sleeping," Abshire told The Sun of Lowell, Massachusetts, for Sunday editions. All four suspects were armed with aluminum bats when Victorino kicked in the locked front door, according to arrest records. The group, who wore black clothes and had scarves on their faces, grabbed knives inside and attacked victims in different rooms of the three-bedroom house, authorities said. The victims, some of whom were sleeping, did not put up a fight or try to escape, Sheriff Ben Johnson said. All had been stabbed, but autopsies determined the cause of death was the beating injuries. Victorino, the last to leave the house, took the Xbox, police said. Left behind were the bodies of Belanger, Michelle Ann Nathan, 19; Anthony Vega, 34; Roberto "Tito" Gonzalez, 28, who recently moved from New York; Belanger's boyfriend, Francisco Ayo Roman, 30; and Jonathan Gleason, 18. They lay in bloody beds, on bloody floors. There were crimson spatters on the walls and the ceiling. "Everyone of these individuals deserves the death penalty. No ifs ands or buts. They all deserve the death penalty for this senseless act, for taking away human life in the manner they did," said Johnson. Victorino has spent eight of the last 11 years in prison and was arrested Saturday for a probation violation. His first arrest was in an auto theft when he was 15, according to state records. He has prior convictions for battery, arson, burglary, auto theft and theft. Hunter, who was with Victorino when he was arrested Saturday, agreed to accompany investigators for questioning. Police said he admitted his role in the slayings and identified the other two suspects. "He was a good kid, he just got with the wrong crowd," said Hunter's father, Dan Washington. "He never seemed to be that type ... that was violent." All four suspects appeared before a judge Saturday without attorneys. They will have a chance to ask for court-appointed lawyers on Monday. A candlelight vigil was held for the victims Sunday evening.